Wide Wedding Bands That Look Great! If you are searching for wide wedding bands and your local jeweler either doesn’t carry these or you don’t like the selection, we have a wonderful selection for you to choose from. We are featuring 4 wide wedding rings in this blog. All four rings featured here are always in stock in sizes from 6-16 (in half sizes), discounted from $300 to $250 each (normally $400-$500 in other websites), and come with our unconditional Lifetime Replacement Guarantee. If any of these rings become scratched, chipped, dented, discolored, or cracked, or if the ring no longer fits properly because you have lost or gained weight, simply ship the ring back to us and we will replace the ring. The first ring is an 8mm band with High Gloss Finish and Slight Dome. The slight dome gives this ring a very elegant look that make the ring look like it was custom fit to your finger. 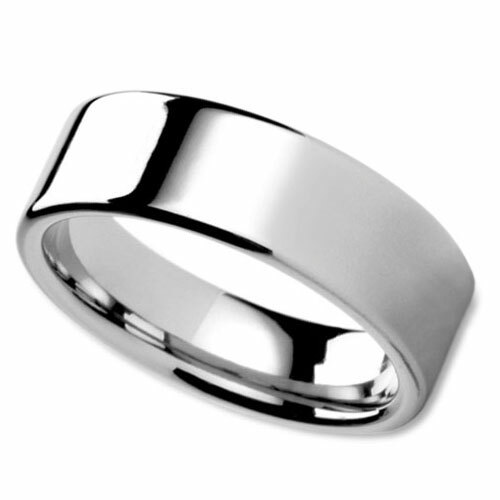 This is a White Tungsten band. White tungsten has a very similar look to platinum but has some key advantages. First, it does not scratch easily and is almost impervious to chipping and cracking. Second, it maintains a very high gloss shine for much longer than platinum or gold. You will be astonished at how bright the ring shines in the sunlight and under bright lights. This high polish will remain for a long time and when it dulls, it can be brought back to its original luster by simply polishing it. The second ring is an 8mm band with a High Polished Flat Surface. This is very similar to the previous ring, but the surface is flat. Of all the wider bands that we sell, this is one of the most requested and purchased rings. It is classically designed with a high polished smooth flat surface. Because it’s White Tungsten, the metal has a brighter look than other Tungsten rings and is even brighter than platinum and white gold. Both men and women are drawn to this ring not only because of its simplicity, but because it has a substantial weight to it. When you wear this ring, you feel that you have purchased something that will last a lifetime (and it will). If you work with your hands on a regular basis and come into contact with surfaces that can scratch a ring, this is the perfect ring for you because you can throw just about any kind of abuse at it and it will still look just like it did the day you purchased it. 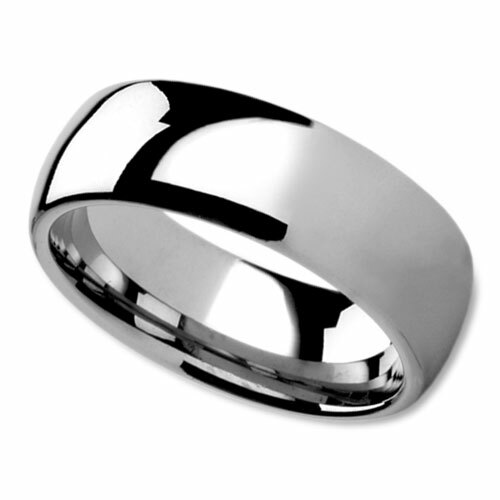 Our third ring is an 8mm band with Brushed Center and High Polished Edges. 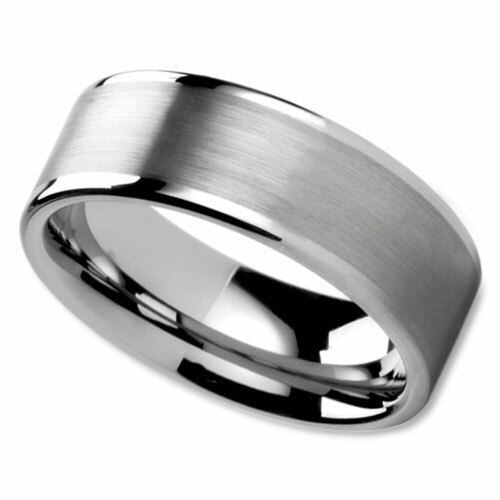 This tungsten ring is created with men in mind with a very masculine brushed center and elegant high polished edges. Of all four wide band wedding rings, this may be the only ring that a man may choose when he wants a ring that he can wear at both work and at formal events and the ring looks at home in either setting. Like the other rings, this ring is scratch resistant and covered by our Lifetime Replacement Guarantee. The last ring is the most unique looking of all the four bands featured here. 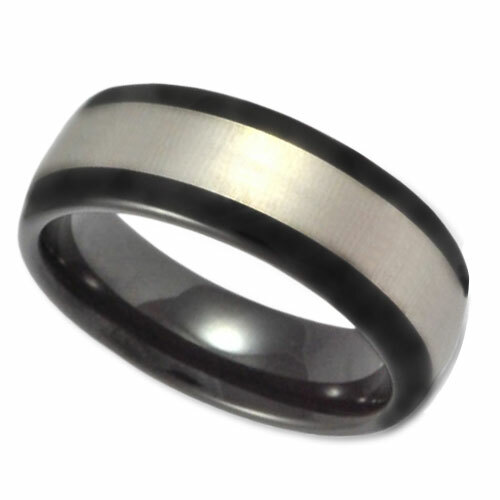 This is an 8mm band with Silver Center and Black Coated Tungsten. The black coating makes this a very striking band and the silver adds elegance to it. When you first feel this ring, you will notice that it feels quite substantial in weight. It is for the guy who wants to wear a ring that doesn’t look like a wedding ring and wants the ring to make a very bold fashion statement. Every guy that sees this ring on you will be very impressed. PreviousPrevious post:The Best Place in Staten Island to Buy Wedding RingsNextNext post:We Stock Wedding Rings for Big Fingers That Look Great!